If you are involved in any area of digital content production then you should take 36:34 of your time and view this talk by Jeff Jarvis (Buzzmachine) at the Video on the Net Conference. You will understand better what is meant by "mass media is losing its mass." You will also glean some great nuggets as to why video on the net is causing an explosion in television. Big media is no longer in control of the conversation. For you, giving up control means gaining influence. It's important you understand how to adapt to this dynamic cultural change. Thanks to Hugh at gapingvoid for the point. Mark Cuban has an interesting post over at Blog Maverick on the differences between online video and television. There has been a near hysteria about online video since the YouTube phenomenon and the merger with Google. It seems that ultimately the internet will become the repository of the majority of digital content. There will be a convergence of screens as new devices allow people to access content on their computers and view it on their wall mounted flat screens. There is continuing fragmentation of the video viewing audience. Downloads to video iPods, YouTube, Google Video... but, there is not yet a mass movement of people who are watching traditional television programming online. More people are watching video online, but as Cuban says, it's snacks and not meals. Keep this in mind if you produce video for the web. Shorter is generally better. People online tend to go into Attention Deficit Syndrome and usually don't have the mindset to watch a 30-minute or longer program. Produce for the medium. Don't expect one edit of content to work across all platforms. Good digital content producers must understand the medium and produce content that is friendly to the users of that medium. "Santa was good to OfficeMax. The company -- which is eschewing TV advertising entirely -- took what it would have spent to make three 30-second spots and created 20 holiday-themed microsites aimed at catching a viral wave and touting its stores as gift-giving destinations." This has to make Madison Avenue nervous. The staple of big-money advertising for years has been the 30-second television spot. Make and average product for average people and pump sales with TV spots. That has been changing gradually, but now the cultural shift seems to be picking up momentum in the advertising world. One great aspect to this change is the shift from the importance of the medium to the importance and salience of the message. Take a look at television advertising. Companies spend hundreds of thousands or even millions of dollars producing a 30-second spot. Most of them are not memorable. But, until recent years even a non-imaginative spot that aired often enough would create a bump in sales. There's a shift of power taking place in the world of communications, advertising and media. It's a trend and not a fad. Intrusive advertising is declining in favor of advertising that people want to watch. Companies who get creative like Office Max will rise. Those who stick with the old models will decay. OfficeMax has made a bold move here to say "screw television, we're betting our future on the web." It will continue to be an interesting story to follow. And, you can count on plenty of others to try to mimic their success. Yes, Bob Dylan, the times they are a-changin'. I'm in Las Vegas this week at the annual NATPE (National Association of Television Production Executives) convention. One of the big topics this year is delivery of digital content (especially video) to mobile devices. Today, about 20% of the cell phones in the US have video capability. Soon that will be 33%. One of the problems in the mobile sector is the lack of good short-form creative content. Viewing habits on cell phones tend to favor content that is only a few minutes in length, rather than full-length programming. While users tend to expect content delivered via Internet to be free, there is precedent for people to pay for additional mobile phone content. For example, people will pay $2.95 to download a Coldplay ring tone (when they can download the entire song legally for $.99). Revenues from delivery of video/TV to mobile devices generated about $123 million in 2006. That figure is expected to grow to $4.3 billion by 2011. Astounding growth predictions. Meanwhile, with the introduction of the iPhone by Apple and a gaggle of new devices that were introduced at CES last week, the hardware in the marketplace is becoming even more video friendly. Ultimately expect to be able to download video entertainment to your cell phone and be able to decide whether you want to view it on your phone, or via BlueTooth consume it through your television or computer monitor. Two years ago the mobile market was discussed as still being future. This year that future has arrived and is about to hit the steep slope of the growth curve. Here's a great article by Stephen King about the upcoming season for one of my favorite TV shows - 24. Sounds like it's going to be as good as ever. Adults and teens will spend nearly five months (3,518 hours) next year watching television, surfing the Internet, reading daily newspapers and listening to personal music devices. That’s only one of thousands of nuggets of information on Americana and the world in the U.S. Census Bureau’s Statistical Abstract of the United States: 2007. According to projections from a communications industry forecast, people will spend 65 days in front of the TV, 41 days listening to radio and a little over a week on the Internet in 2007. Adults will spend about a week reading a daily newspaper and teens and adults will spend another week listening to recorded music. Consumer spending for media is forecasted to be $936.75 per person. "Instead of hiring professional concert documentary crews, a growing number of bands are handing the concert documentary process over to their fans, relying on amateur video to generate low-cost promotional material while increasing fan appreciation in the process. The Beastie Boys had some success with this idea recently..."
Of course, this isn't the answer to most video production needs. But it could be for some. Be sure to take note of the need for a patient editor. 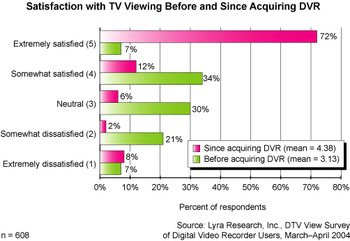 Interesting graph showing the satisfaction of television viewers before and after the acquisition of a DVR (digital video recorder like Tivo). With this kind of love being expressed for the DVR experience, you have to expect that market penetration will continue to climb and that more and more ads will be skipped. However, there is some evidence that recall is higher on ads that are "skipped". The bottom line is that the way people are consuming television is being radically changed when they go DVR. Understanding those changes is going to be key for digital content producers in the future. In a report released today, the FCC supported the enactment of legislation that would make a la carte cable TV a reality. Claiming that consumers could save as much as 13% with a choice on which channels they want and don't want, FCC Chairman Kevin Martin's report flies in the face of the cable industry's contention that bundling channels provides the best value for consumers. A la carte would mean that cable customers could pick and choose and pay for just the individual channels they want to have included in their service package rather than having only bundled options. There has been some concern among cable networks that a la carte would significantly reduce the number of homes carrying their signal. This will take some time to work out. First there would have to be legislation. Then implementation. Then response by the cable consumers. In the end, consumers will be voting with their wallets. It seems good from an overall economic standpoint, but survival of the fittest may reach a new intensity among cable networks as they have to compete head to head for subscribers from house to house.